Sorry for the delayed post! 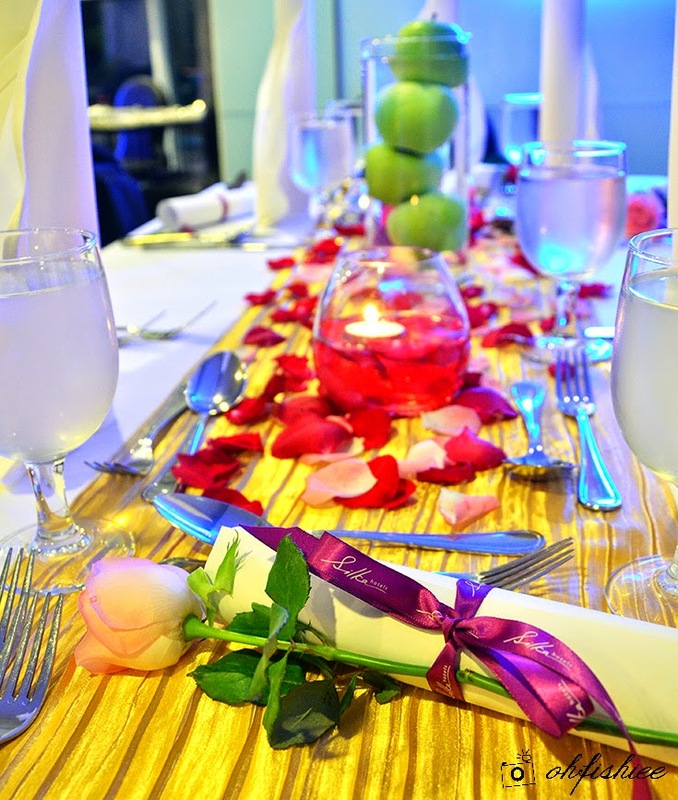 Everyone wants a memorable evening on Valentine's Day without burning a hole in the pocket, don't you agree? 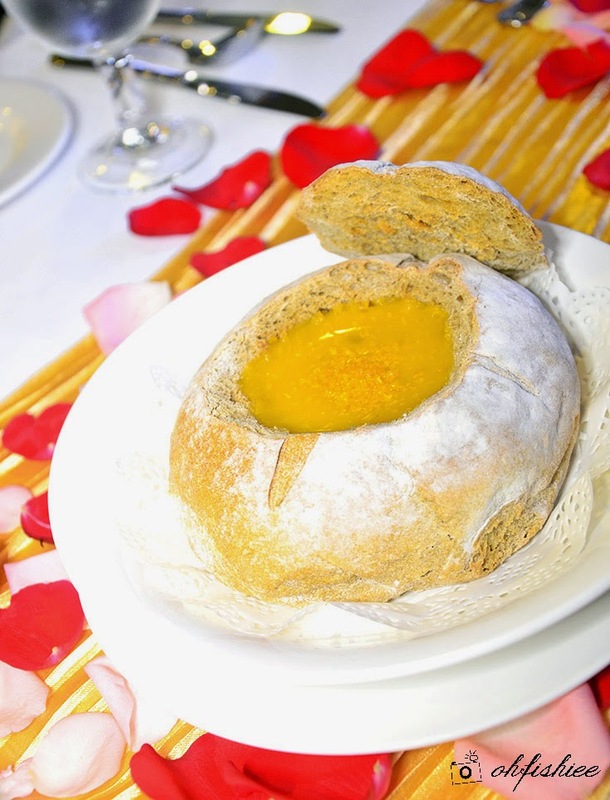 I was at Silka Cheras for its affordable 4-course Valentine's Day Set Dinner at RM288 nett per couple on that love-filled and romantic evening. We enjoyed a sumptuous feast comprising of an appetizer, soup, choice of main course, dessert and drinks over a romantic candlelight setting. 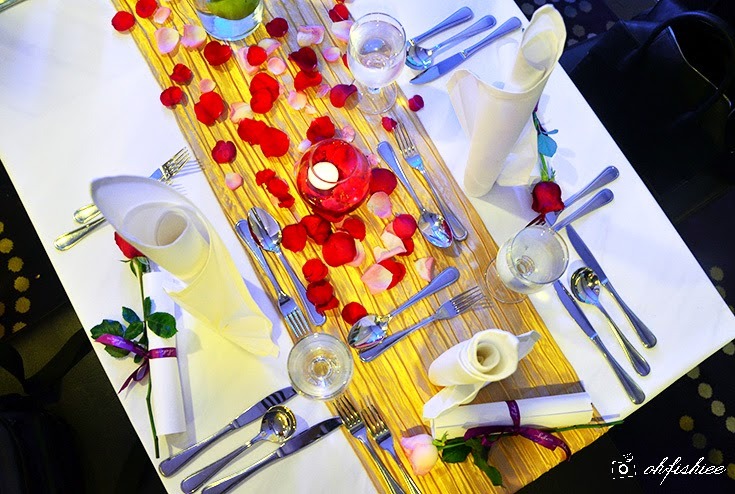 Boasting a modern yet unassuming glass interior, the cafe was transformed into a romantic dining area providing an ideal venue to romance the night away. 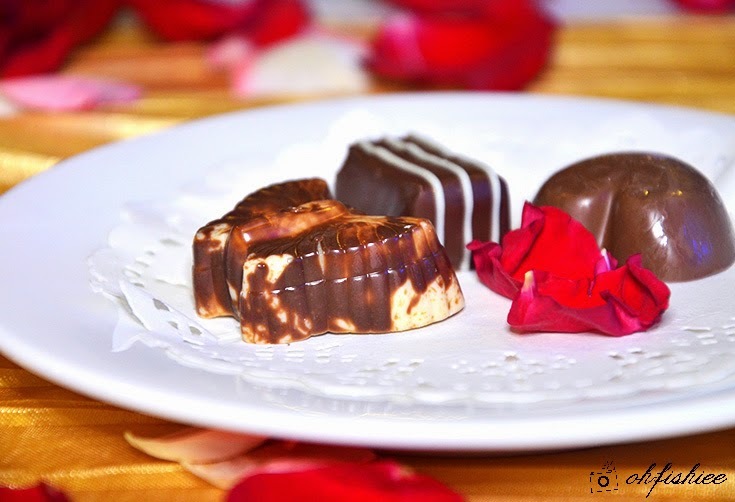 To perfect the night to cherish and remember, ladies would receive roses and complimentary pralines. 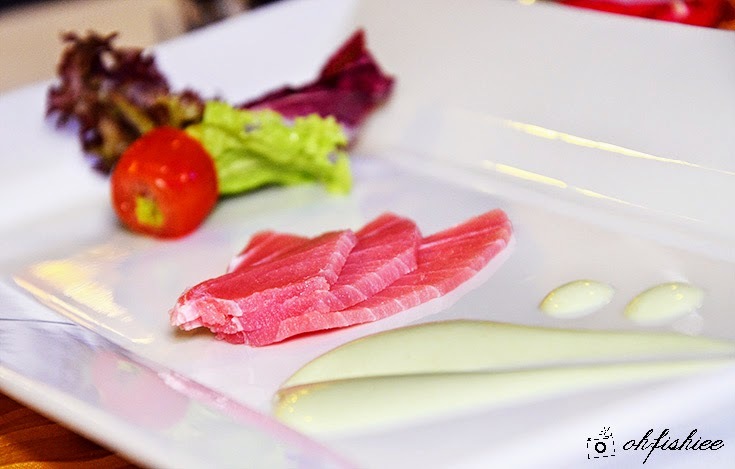 The romance began with a wonderfully simple tuna carpaccio served with in-house wasabi dressing. It was a nice variation from the usual tangy citrus dressing, because mild wasabi added a touch of subtly sweet spiciness without overwhelming the naturally fresh flavour of tuna. Moving to the soup, we were impressed by the beautiful presentation of creamy pumpkin soup served in a crispy rye and charcoal bread crust. As we relished the soup, every spoonful was bursting in smoky flavours and aroma from the roasted whole pumpkin. The zesty orange peel topping also added a nice refreshing touch to it. 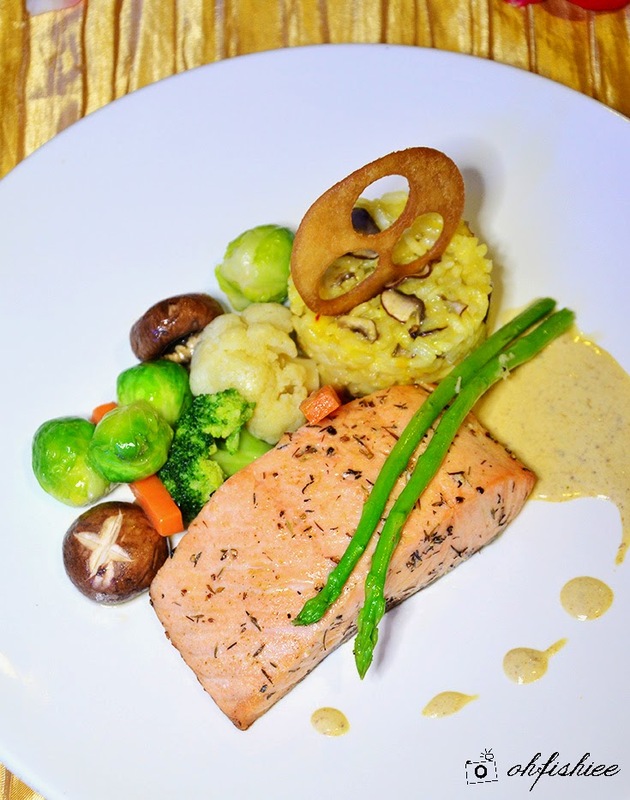 For seafood lovers, the main course came with a choice between lobster and salmon. 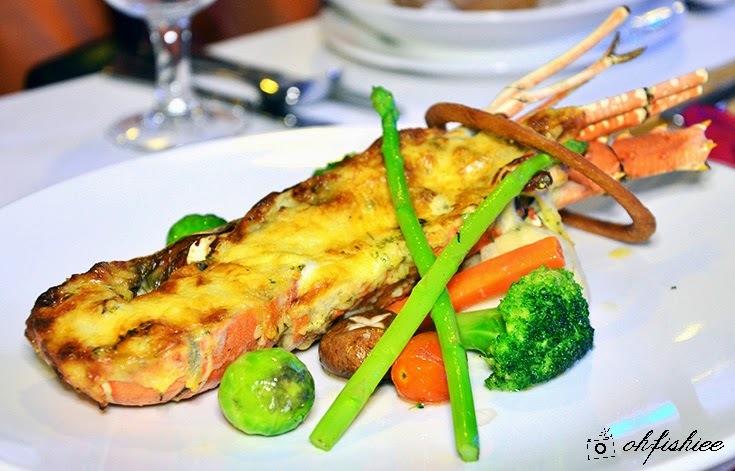 To ensure its utmost freshness, the restaurant used only live, fresh lobster that was grilled to perfection and then baked with cheese. The flesh was nicely cooked and retained its juiciness within the crunchy texture. The star of the evening that kept us glued on our seats was the thick slab of pan-seared salmon marinated with herb and olive oil. It tasted very light and complemented well with the mustard cream sauce and mushroom saffron risotto. 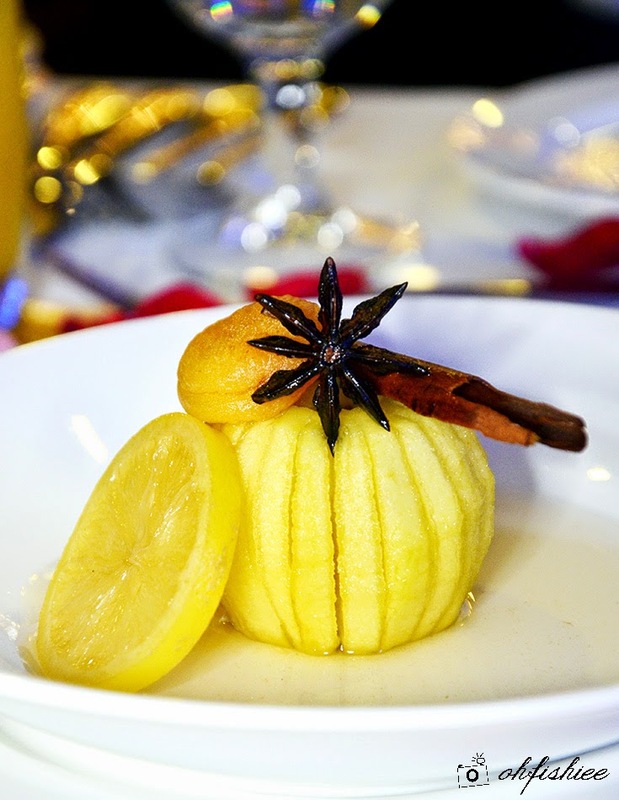 A dessert of beautifully carved poached apple put a sweet ending to the romantic evening. This classic way of preparing such a delicate dessert managed to retain its crunch while exuding the naturally sweet flavour spiced up with cinnamon. Definitely a guilt-free, low calorie dessert to die for! to mark that unforgettable evening! Thanks for the Silka Valentine's Date!